FREE $200 US Shipboard Credit! Satisfy your thirst for adventure and new discoveries when you blend a myriad of exotic locations into one unforgettable journey. Visit destinations like the tranquil shores of Sihanoukville, bustling Bangkok, and Singapore. Southeast Asia captivates with an eclectic array of adventures awaiting your discovery. Sapphire Princess is a cruise ship owned by Princess Cruises that entered service in 2004 as the twin sister ship of Diamond Princess. She is one of the world’s largest cruise ships, with a capacity of 2,670 passengers and is the sixth Gem Class ship built by Princess Cruises. Sapphire Princess was christened on June 10, 2004 in Seattle—the first cruise ship ever to be christened in that port. Currently, Sapphire Princess is sailing Asian cruises from Shanghai year-round until the arrival of the Majestic Princess in 2017. After the arrival, it will resume sailing from China in the summer months, then from November through February, sailing roundtrip Asia cruises out of Singapore. 22-Day cruise with all your meals and entertainment. 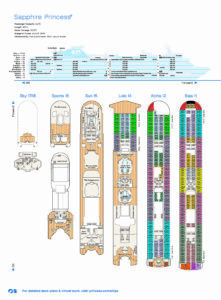 Prepaid shipboard gratuities on your cruise. All port taxes and government fees. available with PRINCESS CRUISES as well as any optional hotel stays with your cruise. Shore excursions are not included on your cruise. Final payment is due by: OCTOBER 24, 2019. SINGAPORE – the very name summons visions of the mysterious East. The commercial center of Southeast Asia, this island city state of four million people is a metropolis of modern high-rise buildings, Chinese shop-houses with red-tiled roofs, sturdy Victorian buildings, Buddhist temples and Arab bazaars. Founded in 1819 by Sir Stamford Raffles of the fabled East India Company, the city is a melting pot of people and cultures. Malay, Chinese, English, and Tamil are official languages. Buddhism, Taoism, Islam, Hinduism, and Christianity are the major faiths. Singapore is an ever-fascinating island boasting colorful traditions, luxurious hotels, and some of the finest duty-free shopping in the world. Lying just 85 miles north of the Equator at the tip of the Malay Peninsula, the island was a haven for Malay pirates and Chinese and Arab traders. KOTA KINABALU, MALAYSIA – Sprawls between the South China Sea and the towering ramparts of the Crocker Range. The capital of Malaysia’s Sabah State in Northern Borneo, the town dates from 1963 and occupies the site of Jesselton, the old British colonial capital. (Jesselton was razed during World War II.) More importantly, Kota Kinabalu is your gateway to the natural wonders of Northern Borneo. Offshore sit the five coral islands of Tunku Rahman National Park, a Mecca for hikers and divers. To the north is Mt. Kinabalu National Park, home to the highest mountain found between New Guinea and the Himalaya. On a clear day, one can stand on its summit and look across the South China Sea to the Philippines. The only remainder of the old colonial settlement is Atkinson Clock Tower, built in 1905 and named after the first British District Officer. NHA TRANG, VIETNAM – Was the capital of the Champa Kingdom, which dominated this corner of Southeast Asia for 13 centuries. North of the city, the great Cham Tower complex overlooks the Cai River and offers mute testimony to the kingdom’s glory. Today, the towers attract locals and visitors alike, many of whom come to meditate while contemplating superb views of the river and the bay. Nha Trang’s tourist district consists of a scattering of colonial era beachfront hotels and sidewalk cafes. The city was a popular spot for U.S. servicemen during the Vietnam War. HO CHI MINH CITY, VIETNAM – Over three decades have passed since the Vietnam War ended with the fall of Saigon. Today, the name of this bustling metropolis on the Mekong River is Ho Chi Minh City. Yet, the essence of the city, a major trading center since the 18th century, remains unchanged. The air is filled with the cries of street hawkers and honking horns. Bicycles, motorbikes, and automobiles fly down the boulevards at dizzying speeds. And everywhere, friendly faces and warm greetings meet you. The port of Phu My (pronounced “Foo Me”) is your gateway to Ho Chi Minh City and the seaside resort of Vung Tau. SIHANOUKVILLE, CAMBODIA – Developed as Cambodia’s sole deep-water port in 1964, Sihanoukville – the former Kampong Som – has become a jealously guarded secret of savvy travelers. This still pristine resort on the Gulf of Thailand boasts beautiful beaches and crystalline waters. Offshore islands offer excellent dive sites and some of the world’s finest big game fishing. Sihanoukville is also renowned for its excellent cuisine featuring superb seafood. Sihanoukville is located on a peninsula some 155-miles southwest of Phnom Penh. 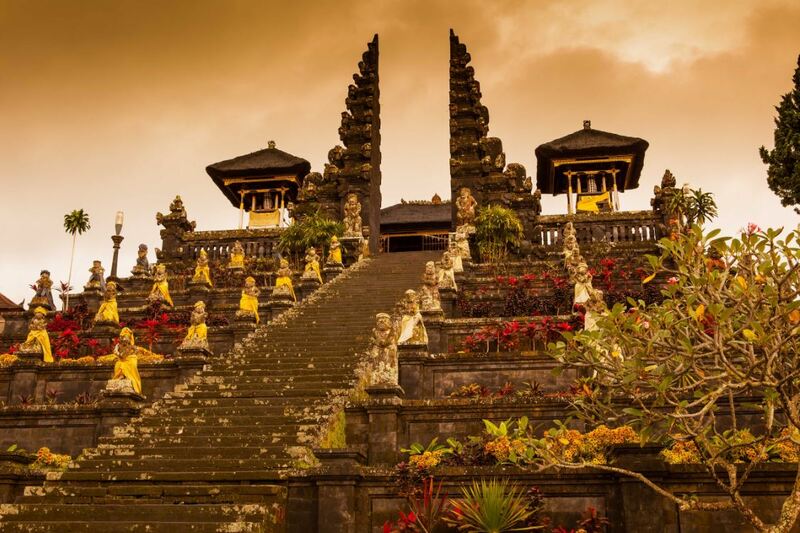 BALI, INDONESIA – For over a century, Bali has fascinated the Western imagination. The island embodies the very essence of the exotic and mysterious East. Steep hillsides of tropical green reveal terraced rice paddies while plantations of coffee, banana, cacao, and fragrant spices line the roads. Monkeys haunt the grounds of a sacred temple in a forest, while traditional villages produce intricately stylized batik, superb jewelry, and beautiful paintings. And Balinese dance, with its angular movements and rhythms, remains somehow stirring and shocking. Bali may be accessible, but it remains forever exotic. For all Bali’s scenic beauty, the island has weathered great natural disasters, from the 1963 eruption of Mt. Agung to a massive earthquake in 1976. The island emerged relatively unscathed from the great tsunami of 2004. KUALA LUMPUR, MALAYSIA – The capital city has grown into a fascinating metropolis. Steel and glass towers stand side by side with graceful stone colonial buildings and mosques adorned with slender minarets. The commercial, financial, economic, and cultural heart of Malaysia, Kuala Lumpur (better known as KL), is a melting pot. Its population of 1.6 million is comprised of Malays, Chinese, Indians, and a mix of different cultures including Eurasians and others. Kuala Lumpur is located at the confluence of the Klang and Gombak Rivers. The city was founded in the 1850s as a tin mining outpost. PENANG, MALAYSIA – In 1786 Francis Light persuaded the Sultan of Kedah to cede Pulau Pinang – the “Isle of Betel nut” – to the English crown. Legend has it that Light persuaded his men to clear the overgrown island of Penang by firing a cannon filled with gold coins into the jungle as an incentive. The island was renamed Prince of Wales Island, and its major town was christened Georgetown after King George III. Whether the story is true or not, Penang quickly became a major trading port for tea, spices, china, and cloth. Here European, Malaysian, Hindu, Arabic, and Chinese cultures met, melded, and flourished. Today George Town is a cosmopolitan city that has preserved its unique heritage and its exotic blend of cultures. George Town is perhaps the best-preserved city in Southeast Asia. It boasts a European-style esplanade and a wealth of temples, mosques, and Chinese clan houses. Listed as a UNESCO World Cultural Heritage Site in 2008, this virgin paradise has no shortage of cultural sights and natural scenery.